This month’s disparate binge listening, a brief list without individual reviews this time. Every one an excellent listen in their respective genres. Most are readily available (check the included links for various formats and sound samples) except for Chick Corea’s Inner Space, it being a compilation of recordings originally recorded in 1966 & 1968, which is long out of print on vinyl but there are a few CD reissues available. I doubt not too many Chick Corea fans actually have this one or even heard anything from it but it’s been my long time absolute favorite of his since I first bought it in the 70’s. I would suggest tracking down a vinyl copy with its gatefold sleeve for maximum joy. Raising Holy Sparks Old Times & End Times is out of print on cassette and is only available from Bandcamp in all download formats, this release deserves a proper release on CD but I doubt that will happen now in today’s independent music environment. I hope someone will prove me wrong. The latest from Stephan Micus called Nomad Songs is like a dear friend when you need one the most. Beautiful, deep recording and probably my favorite of all of his many wonderful works. I think I’ve been listening to this daily for about two months now with no end in site. If you can afford the half speed remaster double LP spun at 45rpm for Jackie McLean’s New Soil through Blue Note’s Analog Productions reissue series please do so. 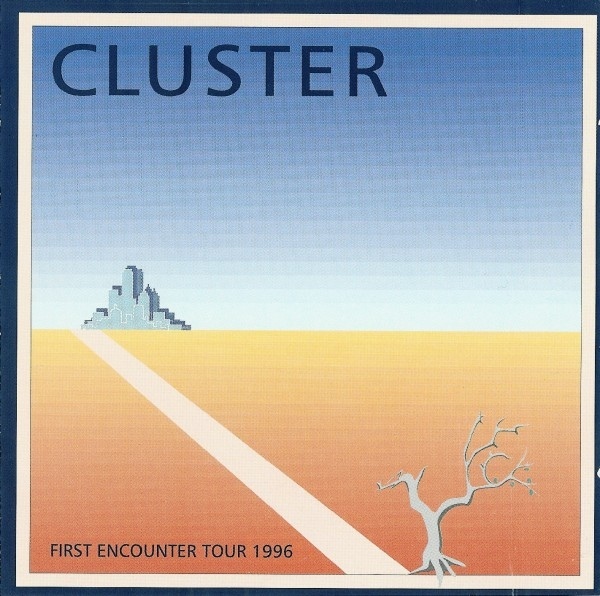 You can probably find one on ebay or Discog’s for about $50.00, essential listening. Thad Jones & Mel Lewis’ Consummation is great to revisit in this age of renewed interest in 1970’s sounding big bands. Most of the new bands around today trying to do this style leave you rather cold after 10 minutes or so, so it’s nice to hear this classic from 1970. The first side alone could teach a few young jazz musicians of today a lesson or two. Richard Young’s new one Inside The Future dropped out of nowhere (as all of his do!) and just by chance heard about it, checked it out and bought it immediately. Wonderful record more like his older stuff. The latest from Norwegian drummer Thomas Strønen and his project Food is definitely his strongest work to date, his hybrid acoustic and electronic drum setup at the forefront on this disc, highly recommended. Interesting new psycho-acoustic work from Elio Martusciello & Fabrizio Casti called Chamber Rites on Die Schachtel got my attention. Of course Bowie’s Heroes and Iggy’s The Idiot need no introduction. Nice to revisit them both at the same time, just like when they were first released in ’77 not too far apart from one another as is the choice now, they work well together for obvious reasons, not to mention the Erich Heckel’s Roquairol inspiration here. All aboard for FUNTIME! I found this performance just recently after re-reading Thomas Jerome Seabrook’s excellent book ‘Bowie In Berlin – A New Career In A New Town’ (Jawbone Press – 2008), where a fleeting passage states that Bowie performed ‘Heroes’ live several times on television as part of his promotional obligations when the album was just released. For some reason after first reading the book in 2008, this fact did not strike a chord within me, but with Bowie’s recent passing and subsequently revisiting the Heroes lp, it being my all time favorite of his, I was intrigued to seek out this performance. Different from the album version, single radio edit, as well as the ‘Helden’ single version sung in German (and as ‘Héros’ in French), this is indeed an elusive, mysterious ‘for TV mix only’ version, with different piano and bass performances never used except for here. The fact that his live band for the show had included Tony Visconti on bass guitar instead of George Murray and Sean Mayes on piano playing Bowie’s piano parts is notable on its own and brings the entire song into new territory. For some reason I think the piano and bass work much better for the overall groove here, maybe because they are louder in the mix, as well as the impromptu ‘cowbell’ part which was actually Visconti banging on an empty tape reel in the studio, and there seems to be no flanger on the bass track which is on George Murray’s original bass guitar part, which although was very intentional in the studio, tended to relegate the bass towards the background and part of the overall ambient wash of the track along with Eno’s synth work. The 3 guitar tracks from Robert Fripp have a totally different mix and balance here as well and are obviously on tape for this performance (since it would be impossible for Robert Fripp to show up for a television performance and play 3 guitar parts). The backing vocals are louder and more pronounced especially towards the end of the song (also being part of the backing tracks the band played along to for this performance). The overall approach here screams ‘radio hit’ for it’s time in it’s neat and tidy 3 minute length. Interesting is Bowie’s vocal approach, Bowie now seems to be saying ‘I’d like to sing this song a bit differently now‘ while this mysterious band is playing live on television. His rock solid and affirmative approach here also tells me he has finally left the excesses and self destruction within a cocaine haze of his years previously living in Los Angeles finally and thankfully behind him for good, which is what drove him and Iggy Pop to move to West Berlin in order to kick their habits in the first place and consequently lead Bowie to create this one of a kind work of art, one of the most important and greatest albums of the 1970’s. The one thing I do miss is Eno’s beautiful EMS Sinthi A suitcase synth parts and Bowie’s ARP Solina strings and Chamberlin ‘sax stabs’ which I simply do not hear at all. Unfortunately, there’s nothing I could find written or spoken about anywhere as to why they never released this mix on a subsequent record. Or who the rest of the musicians on stage indeed were during this TV show since they simply are not seen on camera. It seems such a shame to not have even filmed the band playing live with Bowie and at least showed them here and there during the performance, a bad TV production moment if there ever was one. But I would surmise Dennis Davis and Carlos Alomar are indeed on drums and guitar. Even though they are simply not credited on the You Tube info, it’s obviously them playing. Came upon this poster early this bitter cold morning on desolate Clinton Street and stopped in my tracks. They are no words at this point for me, still in shock / denial / disbelief two weeks on. The world has lost a genius, and heaven has one more angel. It’s that time of the year again to shed a light on some of the best new recordings that came my way this year. These are the ones that I found myself going back to time after time. Please note: this list has been amended since first being published due to some records that just came my way in December. I used to regularly do Heavy Rotation lists on the Faith Strange website and its sister WordPress blog but haven’t done one in quite some time and as the Faith Strange site is now being redesigned and will be up and running anew in June, I feel my listening picks are much better at home on the Out Of Work Communist pages from now on. So, here’s the first. I must admit that when I first bought this, (actually I grabbed the last one available direct – sorry, folks. But as of this writing, there looks like there might be a few left on Bandcamp), I didn’t give it my full attention when I played it and it unfortunately got lost on the pile of cds. After listening to this again, non-stop for the last 2 months, I can say this album gets my highest recommendation. Beautiful, lovely harmonies, and arrangements by Ingrid are all top notch. Music co-wriiten with Lorenzo Scopelliti a.k.a. Saffron Wood and Richard Werbowenko. Mastered by Emily Lazar & Joe LaPorta at The Lodge so you KNOW it’s great. 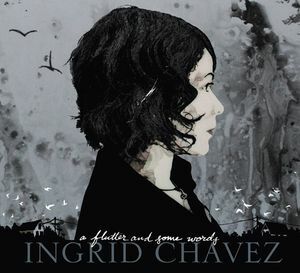 Available on Ingrid’s Bandcamp page. A must have for David Sylvian fans. 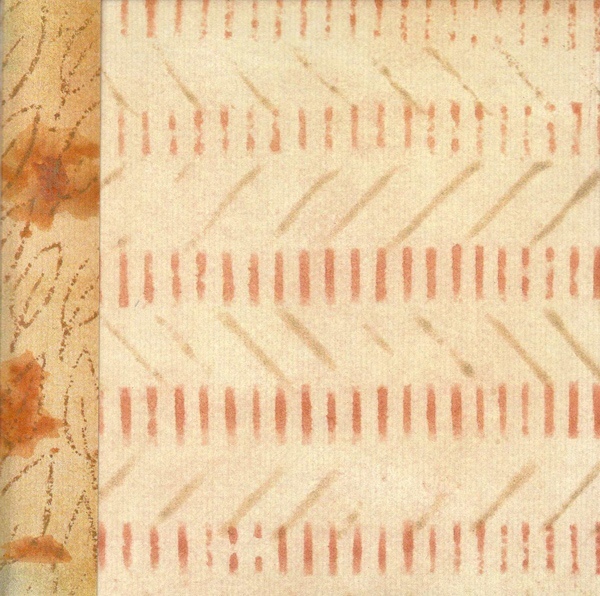 Originally released in 2003 and consisting of two long form tracks, Kasuri and Flaxen, this outing reunited the two ex-Ora members for a new exploration into sublime drone. Exceptional as always is the work of either two artists, The Days After proves years after being released as still a wonderful recording totally suited to quiet Summertime moments and having the power to completely and absolutely transport one to a state of relaxation and dreaming. Unfortunately out of print but may be found secondhand on Discogs. I’m usually not one for buying compilations, especially from artists I consider my favorites and have every release of, but I do make exceptions now and again, usually to satisfy the completist in me. In this case, All The Blue Changes does contain some previously unissued songs that are a must to have and adding them to this anthology completes its aural flow nicely. Having been a no-man fan from their inception on One Little Indian (1987), I’ve stayed with their discography all through these years but honestly can’t say the same for Porcupine Tree’s output, having also been a fan since their first album (1982). Porcupine Tree changed direction into a harder edged outfit right after In Absentia and consequently pretty much lost me with it, sorry to say. 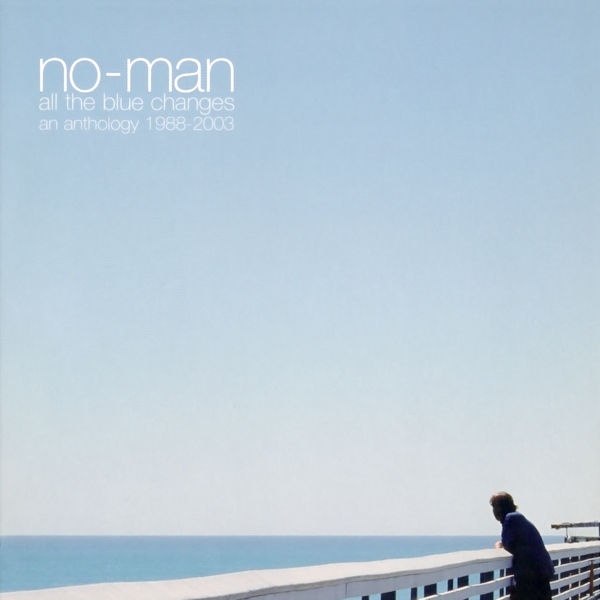 All The Blue Changes is a great place to start if you do not know no-man at all or have heard very little from them, and honestly, they never really hit over here in the U.S.A. the way they really should have so maybe this release will win some new fans. I remember seeing Porcupine Tree at The Bottom Line around ’92 or ’93 and struck up a few conversations with people that came to see PT and was incredibly surprised to find they had absolutely no idea of who no-man was and here was one half of the band (Steven Wilson) in a band they had paid to come to see. I’ll never understand how certain bands actually get popular while some just are destined for obscurity. I personally love the inclusion of some of the early material here, with that being my favorite period of the band, right around ‘((Speak))’ and ‘Housewives Hooked On Heroin’ and ‘Wild Opera’. Wonderful artwork by Carl Glover. Looking forward very much to the release of Tim Bowness‘s new one ‘Stupid Things That Mean The World’, which from the early clips, sounds like a winner as usual. 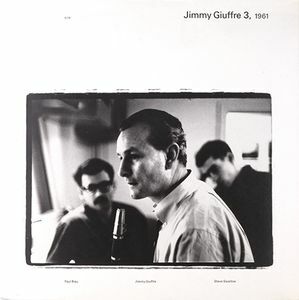 Comprised of the out of print albums ‘Fusion’ and ‘Thesis’ originally recorded in ’61 by Creed Taylor on the Verve label and later reissued on this ECM set, this double album finds Jimmy Giuffre (clarinet), Paul Bley (piano) and Steve Swallow (double-bass) engaging Giuffre’s unique concept of a drummerless trio and honestly, into nothing at all similar to anything happening in jazz at the time. With the added bonus of some previously unissued tracks, this set is worth finding on its historical importance alone. It’s been said that these recordings were the impetus behind Manfred Eicher’s idea to start ECM records years later in 1969. That should tell you something about these recordings right there. I understand there is a vinyl reissue of this out now on Bureau B but it’s not complete since it’s the reissue of the single disc version. This double cd version is the one to get. One of the high points for me for Hans-Joachim Roedelius and Dieter Moebius which is a hard thing to say since everything they’ve ever done was astonishing. This version has 13 tracks all live from their 1996 US tour, one that I unfortunately missed, but can cherish with this document of it. Superbly recorded and mixed for a live recording, every nuance is captured. Speaking of compilations of favorites, this one really brought me back to the great old club days of NY in the 80’s. Given to me by a dear friend to listen to while recuperating from an illness, this comp is filled with dance hall day memories of a much happier time when the world was a much different place and you found yourself dancing the night away. 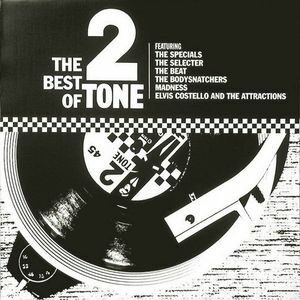 My favorite is the (controversial at the time) Rhoda and Special AKA track ‘The Boiler’ which is killer and of course ‘On My Radio’ by The Selecter which anytime I heard that song in a club got me onto the dancefloor immediately if not sooner, for the rest of the night. Also features tracks by The Beat, Madness, Elvis Costello & The Attractions, The Body Snatchers. A treasure collection. Here’s my pick of the best music of the year that came my way that proved to have the most lasting impressions on me. – due to some new ridiculous corporate rules passed down from Mixcloud, not allowing people in various countries to see playlists they are listening to, here is the playlist for Broadcast Eight.